Native to the mountainous regions of Mexico, the mountain agave, Agave montana, isa beautiful and architectural plant, forming a huge solitary rosette of densely packed, spined, deep-green leaves with a white powdery patina. In the wild it is exposed to cool moist cloud and more of a temperate climate than other agaves and is therefore better suited to the British climate than some of its less hardy cousins, and has even been known to survive harsh British winters outside, without any protection. 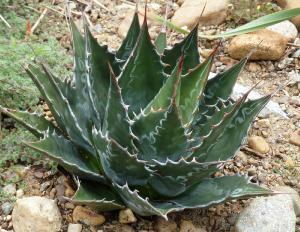 For best results grow Agave montana in well-drained soil in full sun,and water sparingly. Despite being hardier than most agaves (down to -10°C), it is a good idea to give it protection in winter. It has survived down to -12°c, however it does need free drainage and the power of the sun in winter to afford the best chances of success. Planting on a south facing slope in free draining soil is ideal, where it gets the most sun exposure and any excess moisture can drain away.